Our Vamos a Leer book group meets this evening to discuss the young adult novel, The Only Road, by Alexandra Diaz. While we always want to take a moment to highlight the authors being read in our local meetings, Diaz has special significance for us because she’s right here in New Mexico with us as a resident of Santa Fe! Beyond that succinct summary, we can add that she is the author of several young adult novels which have been well received. Her most recent book, The Only Road, was designated as a Pura Belpré Honor Book and an Américas Award Winner in 2017. As the publisher writes, “Inspired by true events, The Only Road is an individual story of a boy who feels that leaving his home and risking everything is his only chance for a better life. It is a story of fear and bravery, love and loss, strangers becoming family, and one boy’s treacherous and life-changing journey.” It some ways, it reads as an even younger version of Enrique’s Journey, although here we learn of Jaime and his sister, Ángela, as they come northward from Guatemala to escape the violence surrounding his family. It’s perhaps that last point which captures most accurately why the book drew us in – Diaz’s ability to speak to a sense of shared humanity. This is a book to balance out the apathetic or dismissive news headline, and instead draw out an empathetic understanding of youth migrants. Image: Photo credit to Owen Benson. Reprinted via KidLit441. Join us on Monday, March 12th at Red Door Brewing (400 Gold Ave SW #105) from 5:00-7:00 pm to discuss our next book. 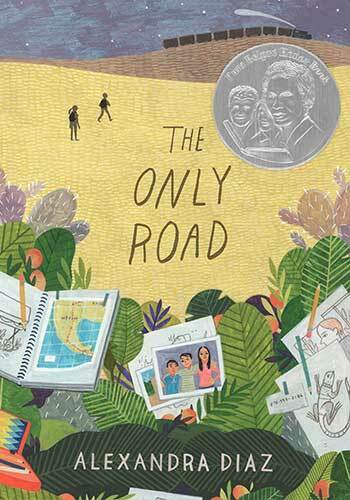 We are reading The Only Road (Grades 3-7) by Alexandra Diaz. We’ll also be raffling off a copy of April’s featured book, How I Became a Nun by César Aira. Join us that evening to be entered! We’re pleased to pass along the information concerning a new Global Read Webinar Series which is co-sponsored by an organization with which we work closely, the Consortium of Latin American Studies Programs (CLASP). This new webinar series is FREE and open to all, and will emphasize reading across cultures and diverse social justice books for 7-12th grade classrooms. The first webinar is happening tomorrow, February 8, at 6:00 -7:15 PM CST. Margarita Engle, one of our beloved authors here at the LAII and the current national Young People’s Poet Laureate, will discuss her book Lion Island. The Américas Award explores the diversity of Latin America by focusing on Cuba with award winning author, Margarita Engle. Engle, the national Young People’s Poet Laureate will discuss her book Lion Island and share teaching and discussion ideas to explore the story of Antonio Chuffat, a young man of African, Chinese, and Cuban descent who becomes a champion for civil rights. Discuss the historical context and learn more with the author and Associate Director of the University of Wisconsin – Milwaukee’s Center for Latin American & Caribbean Studies and founder of the Américas Award, Julie Kline. This webinar is sponsored by the Consortium of Latin American Studies Programs (of which the LAII is a member) with additional support from Tulane University’s Stone Center for Latin American Studies, Florida International University and The University of Florida’s Center for Latin American Studies. Once a month, the World Area Book Awards will sponsor a 60 minute webinar on a book recognized by one of the awards and facilitate a discussion with the author on how to incorporate the book into the classroom. The spring webinar series focuses on social justice. We encourage you to read the books with your colleagues, students, and community, and then join us to hear more from the author. The books are appropriate for students in grades 7-12. If participating in all four webinar sessions, participants will receive a certificate of completion. Be sure to join the conversation with our webinar hashtag #2018ReadingAcrossCultures. All sessions are free and open to the public. All times listed refer to Central Standard Time (CST). Sponsored by the Consortium of Latin American Studies Programs, the South Asia National Outreach Consortium, the Middle East Outreach Council, and African Studies Access Council. To learn more and to register, visit the Global Read Webinar Series website. ¡Feliz primavera! I’m thrilled to share another Américas Award interview with you, this time featuring Duncan Tonatiuh. Two of his books, Esquivel! : Space-Age Sound Artist and The Princess and the Warrior: A Tale of Two Volcanoes were chosen to receive Pura Belpré Illustrator Honor Awards in 2017. Read on to learn more! Duncan Tonatiuh (toh-nah-teeYOU) is the author-illustrator of The Princess and the Warrior, Funny Bones, Separate Is Never Equal, Pancho Rabbit and the Coyote, Diego Rivera: His World and Ours and Dear Primo. He is the illustrator of Esquivel! and Salsa. His books have received multiple accolades, among them the Pura Belpré Medal, the Sibert Medal, The Tomás Rivera Mexican-American Children’s Book Award, The Américas Award, the Jane Addams Children’s Book Award and the New York Times Best Illustrated Children’s Book Award. For more about his work, visit http://www.duncantonatiuh.com. HANIA MARIËN: You have an author name pronunciation guide on your website – can I ask how often your name has been mispronounced? Do you remember any particular experiences that stuck with you? DUNCAN TONATIUH: It gets mispronounced very often. It is not hard to say Toh-nah-tee-YOU, but if you read Tonatiuh in English it looks odd. I sometimes tell people to not look at the name when they say it. Tonatiuh means sun or god of the sun in the Nahuatl language, which is the language the Aztecs spoke. Tonatiuh is actually my middle name. Since my artwork is inspired by Pre-Columbian art I decided to sign my books Duncan Tonatiuh because I feel that it represents well what my artwork and books are about. HANIA MARIËN: Did you read a lot with your family growing up? Do you remember any particular stories that inspired you? DUNCAN TONATIUH: There were a lot of books around in my house when I was a kid. Some of the first books I remember reading are Horton Hatches an Egg, The Little Prince, and a book about a Mexican woodcutter called Macario. When I was in third grade I was really into the Choose Your Own Adventure series. My interest in reading and writing definitely began when I was a kid. HANIA MARIËN: Can you elaborate on why you believe the stories you choose to write about are relevant to all students? DUNCAN TONATIUH: I hope that my books are relevant to all children. I think they are definitely important for Latinx children. In the U.S. only about 3% of all the children’s books that are published every year are about or written by a Latinx, even though we are one of the largest groups in U.S. I think it is important for Latinx children to see themselves in books because it lets them know that their culture, their voices and experiences are valuable and important. I hope my books are relevant to non Latinx children too. When children learn through books about people different than themselves they are less likely to have prejudices or be afraid of them when they are adults. I think that books can help children learn that we are all humans regardless of our skin color, national or ethnic background, religion, physical abilities or sexual preferences. HANIA MARIËN: How can honoring the past help us understand the present? How and why might this be important at this moment in time? DUNCAN TONATIUH: I made a book called Separate Is Never Equal about Mendez v. Westminster, a civil rights case that desegregated schools in California in the 1940’s. At the time Latinx children in many parts of the Southwest were not allowed to attend school with white children. I made that book for two main reasons. One is that it is an important piece of American History that not many people know about. The other reason is that although segregation is no longer legal the way it was in the 40’s, there is still a lot of segregation that happens in schools in the U.S. today. According to a recent study by the Civil Rights Project at UCLA African-American and Latinx children are twice as likely to attend a school where the majority of the students are poor and where less than 10% of the students are white. Their schools therefore tend to have less resources and less experienced teachers. I think that the story of the Mendez family can show students that it took courageous people to stand up against the prejudices that were prevalent at the time. I think it is a very important lesson today, given all the hostility that we see –especially from the current administration—towards Latinxs, Muslims, the LGBTQ community and other groups. HANIA MARIËN: When you write a book, what is it you ultimately hope to share with your readers? DUNCAN TONATIUH: I try to make books that are entertaining and interesting. My books tend to have an educational component too. Sometimes they teach young readers about art, history or social justice. But hopefully they do so in a way that is enjoyable and that doesn’t feel forced. As an author-illustrator sometimes I’m invited to visit different schools. When I present at a school I try to talk with the students and I try not to talk down at them. I share with them my process for making a book and tell them about what inspired me to become an author/illustrator. I hope that my love for reading, writing and drawing encourages them to enjoy and work on those things themselves. Hopefully my books have a similar effect. HANIA MARIËN: In Separate is Never Equal you chronicle Sylvia Mendez’s family’s efforts to end school segregation in California. It’s clear that our schools still do not provide equal opportunities to learn for all students. In your opinion, how and to what extent do we see the legacies of Brown vs. Board of Education and Mendez vs. Westminster in our education system today? In your opinion, where do we go from here (i.e. what shifts would you like to see in education)? DUNCAN TONATIUH: There is a lot of segregation in schools in the U.S. today. It is a big problem and I am not sure what the solution is. I think one important step though, is to acknowledge the issue and talk about it. I think a lot of people are blind to this problem or choose to ignore it. Learning about cases like the Mendez case and the Brown case helps people see how segregation has affected students in the past. It can also be a way to start discussing the current situation and think of steps we can all take to create a more fair landscape for students. HANIA MARIËN: How might a teacher use this book to generate discussion about the legacy of school segregation with middle or high school students? DUNCAN TONATIUH: I think the book can serve as a good introductory text. The Américas Award has created a wonderful educator’s guide with different ways to use the book in the classroom. You can find a link to it and to other guides the Américas Award has created here: http://claspprograms.org/pages/detail/62/Teaching-Resources The guide is designed for elementary school students. It includes a list of complementary literature, though, and some of the literature it mentions is geared towards young adults. I think the book can spark discussions but also projects. It is very exciting for me when students use my books as a jumping off point. After reading Separate Is Never Equal a group of fourth graders in Texas told me they were going to analyze who went to their school and whether it was segregated in comparison to other schools in their district. I think it would be interesting for middle school and high school students to take on similar projects. HANIA MARIËN: In a TedX presentation you mention that migration is one of the key issues that concern Mexico and the United States. What advice would you give to teachers interested in discussing current events and policy decisions related to migration with their students? DUNCAN TONATIUH: I think my book Pancho Rabbit and the Coyote can be a good discussion starter. The book is an allegory of the dangerous journey migrants often go through to reach the U.S. The book also shows how difficult it is for families to be separated. We hear the word immigration often in the media but we rarely hear about those aspects. When discussing immigration politicians often talk in statistics about the economy, or worse they use immigrants as scapegoats and claim they are terrorists and drug traffickers. In reality immigrants are some of the hardest working people and take on some of the most grueling jobs. It is hard to keep up with the Trump administration and all the policy decisions they are making. I think immigration should be thought of as a humanitarian crisis, not as an issue of national security. People don’t leave their homes and risk their lives in an extremely dangerous journey to a foreign country because they want to. They do so because they are surrounded by poverty and violence at home and can’t find a better option. HANIA MARIËN: Congratulations on your recent 2017 Pura Belpré Illustrator Honor Book Award. Can you tell us a little bit about this most recent book and why you wrote it? DUNCAN TONATIUH: I received two honorable mentions for illustration from the Pura Belpré Award this year. One was for Esquivel! which was written by Susan Wood and published by Charlesbridge. The book is a about a very creative and groovy Mexican composer named Juan García Esquivel. I had fun listening to Esquivel’s music and looking at fashion from the time to inform my drawings. I enjoyed creating hand-drawn type for different pages. The other honorable mention was for The Princess and the Warrior. I am the author. It was published by Abrams. The book is my own version of a legend that explains the origin of two volcanoes located in central Mexico: Iztaccíhuatl, the sleeping woman, and Popocatépetl, the smoky mountain. The story has some similarities to Sleeping Beauty and to Romeo and Juliet, but it is set in the Pre-Columbian world. I really enjoy fables and fairy tales, but most of the ones I know or have read come from the European tradition. I think it is important to learn and celebrate folk tales from other cultures and traditions too. I first heard the legend of the volcanoes when I was a kid. I recalled it recently and I wanted to share it with young readers today.